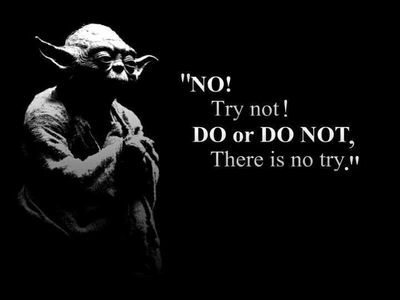 - Yoda responding to Luke Skywalker asking how he'd ever get his x-wing fighter out of the swamp. "Who do you think will win the Super Bowl?" a friend asked. I've been thinking about the impact of mindfulness and mental image on performance and so I said that I thought that the team that would win is the team that truly sees themselves as the winners. Not which team was saying the most in front of the cameras. I'm not talking about hype. But deep in their hearts, which players clearly see it as "being like them" to win the game. You see, this is where it matters, that deep in our hearts as athletes we believe that we are winners. That when we mindfully listen to the inner voice deep inside us, it says that we can do it. One story I've heard is about a world championship shooter whose rifle was damaged just before a match and he would have to borrow one. This was a huge disadvantage, just like borrowing a bike or shoes would be for a cyclist or runner. But that didn't derail him. He said, "Wouldn't it be something to win with a borrowed rifle? "; he went on to do just that. He didn't let the circumstances matter. He didn't let despair, or some belief about the future derail his inner image of being a champion. He still expected to win because that was the image of himself that he had developed. When your mindset is an expectation that you will do well, winning becomes possible. The expectation comes from an inner feeling about your performance. There is a harmony between the expectation and the performance. This is something that we can develop. When I've talked with people who have won championships, won Olympic or world medals, I'm amazed at their mindset. Frequently they tell me that the medal was their's. They expected to win. Deep in their hearts, they knew it. I've also been surprised though that frequently they are in a flow state when they are competing. They are not thinking about winning; they aren't living in the future. They weren't trying to win the competition, those that were focused on winning during their competition rarely did win. Rather, they are connected to their process. They are thinking about using their skills, both physical and mental. They have learned to let go, to trust that by staying in the present moment (the immediate hill they're climbing, the pitch they're swinging at, the length they're swimming) they'll keep their focus on executing and that winning will come as a result. They don't let their focus be distracted by who else is competing, by hype, by the media, they let their best flow. These days you hear all the time, "go out and have fun". Easy to say, but when you care about competing, it's hard to do. But again, the best athletes do have fun. They work hard in training and work easy in competition, allowing themselves to be in the present moment and to let the best of their abilities flow, rather than distracting themselves by focusing on who the competition is. They are firmly anchored in the mental image of themselves as winners. The time to work on seeing ourselves as winners isn't in the moment of performance, but rather during the time of practice and preparation. Just as we work on our swim stroke or on our zone 2 performance during the off season, we should work on the image that we hold of ourselves as athletes. So, I'd like for you to bring your mindfulness skills to the task of developing your mental image as a winner. I recommend focusing on being a winner (whatever that means to you), versus winning, because focusing on being a winner keeps you focused on the process of winning rather than the outcome. Begin by settling into a comfortable position in a quiet place. Close your eyes and begin your deep breathing. Do this for several minutes. As you breathe, bring into your mind the image of yourself as a winner (whatever that means to you). Notice the sights in this scene. Notice the sounds of your scene. As you notice this scene you've formed, repeat a phrase to yourself, something like: "I am a winner", " "I will bring my best performance to the race", "I can! ", etc. ; the phrase can be anything at all as long as it is meaningful to you and connects you to being a winner. Say it several times to yourself as you notice the scene. Feel free to add details that represent being a winner to this visualization. Remember that the more specific it is, the more that you rehearse this scene, the more powerful it will be. This scene becomes an anchor point for you. You can come back to it when you need to reaffirm that you can nail your performance. It can also be the point from which you unleash your best performance. In addition to visualization, you can also use your observer mind to simply notice the situation you're in (e.g., bad head winds during a ride) or to let go of an unhelpful thought by just labeling it "thinking" and coming back to your effort. Also, if something distracts you from your own process, anchor to the present moment by noticing your breathing. These are just some of the mindfulness skills in your tool box that will help you to develop your image of yourself as a winner. The more you develop that image, the more you will perform that way no matter what the conditions are or who you compete against. Feel free to reach out for help with developing your image with any questions.